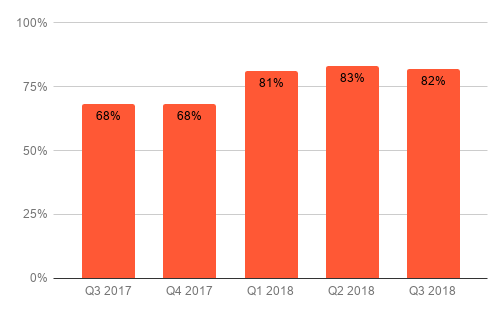 The average Video Completion Rate remained steady at 82% in Q3 after reaching a high of 83% in Q2. The rate has remained very high for seven quarters with little fluctuation. For advertisers emphasizing viewer completion over click through rates, this is welcome news. 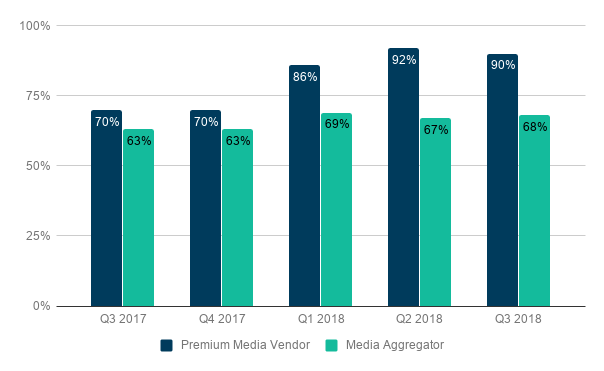 The Video Completion Rate for premium sites decreased slightly in Q3 to 90% after hitting an all time high in Q2 of 92%. The rate for aggregators increased from 67% to 68%, quarter over quarter. The high completion rate on premium sites is among many metrics that point to the ongoing strength of premium publishers and their ability to engage consumers in a reliable, brand-safe environment. Video completion rates for 6-second, 15-second and 30-second ads remained high in Q3, though a bit lower than in Q2. 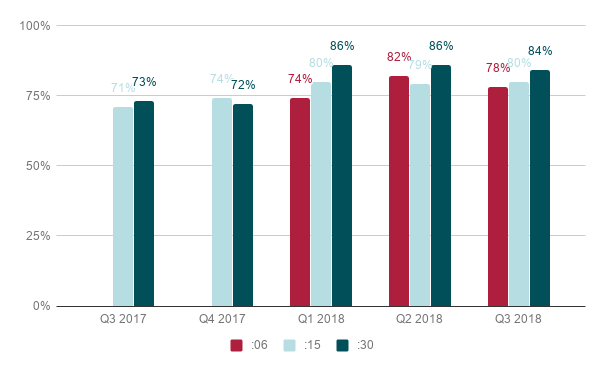 6-second ads saw the biggest change from Q2, a decrease from 82% to 78%. 15-second ads were up very slightly from 79% to 80% and 30-second spots decreased a bit from 86% to 84% from Q2 to Q3. 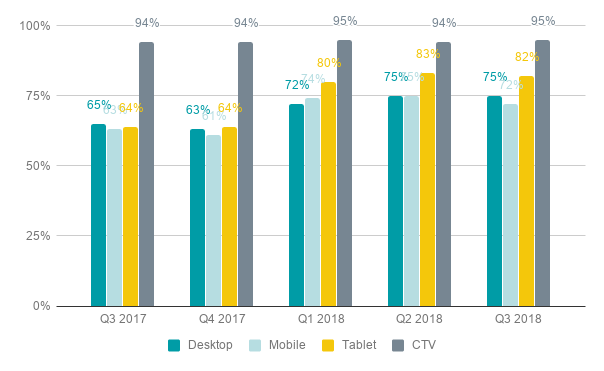 The Video Completion Rate for desktop held steady at 75% quarter over quarter and the rate for tablets decreased just slightly from 83% in Q2 to 82% in Q3. Mobile (smart phones) declined from 75% in Q2 to 72% in Q3. CTV, the star of our Q3 video benchmarks report, increased to 95% from 94% in Q2. Viewers tend to be committed to the content they choose to watch on connected TV and they often do not have the option to skip the ads.